Sometimes, no matter how much of a realist one is, it's nice to tell the real world to go to hell for a few hours and escape through the pages of a book to a realm of bold men and beautiful women and hot sizzling romances. And if you lean towards something slightly more substantial than your run-of-the-mill M & B's, (and by this I don't mean to insult the M & B's; it's just that they're so…well, short) you should definitely give Someone to Watch Over Me a try. Judith Mcnaught really needs no introduction. With more than a dozen bestsellers under her belt, she's definitely no stranger to success. Someone to Watch over me continues in the series of contemporary romance that includes Perfect, Midnight Whispers, and Paradise. The story opens with an accident. Broadway actress Leigh Kendall planned on meeting her husband, Logan Manning, in a mountain cabin. However she gets lost, is hit by another car and is rescued near death. Her severe injuries do not keep her from trying to find her husband, though, as it soon becomes apparent that he is missing. Logan has some secrets, but Leigh does too. A childhood acquaintance steps in to help her when she can trust no one else and an interesting relationship develops. Sadly, this friend is an Italian with a prison record and is rumored to have ties to the mob. Could it be that Mcnaught is trying to break stereotypes? Another character laboring under stereotypes is the gay Broadway director. The minor characters add spice to an already sumptuous story. McNaught fans will recognize Joe O'Hara, chauffeur/bodyguard to Matt and Meredith Farrell, who appear in another of her books. A sister of another favorite character also makes an appearance. Introduced here are Samantha Littleton and Mitchell McCord, detectives in the Manning case. Their interaction and sparring provide some of the most exciting moments in the book. Hopefully, they will return to solve new cases in McNaught's books. The villain can be spotted by the middle of the book, which is where the action really takes off. A second tragedy is a surprise that helps keep the pages turning toward the conclusion, which provides satisfying endings for characters that the reader will grow to care about. 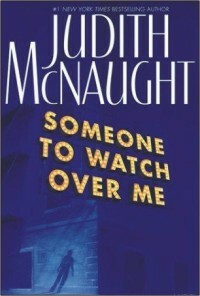 With suspense, action, twists and romance, Someone to Watch over Me promises to be a thoroughly entertaining read. Last Saturday when I walked into my Mom's room, I found the TV switched on to an A-list Bangla Channel. I realized that the channel was showing a "Miss Photogenic" pageant. I found this whole concept of Miss This and Miss That in Bangladesh quite lame because if we needed to have any such thing on a regular basis then it should be a Miss Bangladesh Pageant. In the meanwhile, pure perversion led me to watch the show. Now having watched the show, I'm grateful because the Lord has rectified quite a few of my misconceptions. If you ever keep track of the Miss India or Miss World Pageants, you'll always notice that there are always feminists protesting outside the venues claiming such contests degrade women because they only ask for beauty not brains. And time and time again the contestants all turn out to be well educated and well versed (proving the protestors wrong). But during this Miss Photogenic Pageant when protestors were finally needed, they didn't appear. Why protestors? you ask. Well why not? I mean for the first time in my life I watched a beauty pageant where not only were the contestants lacking wisdom but it seemed as if the judges weren't required to have too much insight either. I would have thought that the feminists would team up on an opportunity like this. But alas, as fate would have it, I will be the only one protesting. But then again the pen is mightier than the sword! This pageant in true Dhaliwood style had all the sing-song gyrating numbers to fill in between the rounds. Don't even get me started on the wardrobe because being a fashion designing major I know that if the fashion police got a wind of this, there would be some serious arrested development to the designer's business. Anyways, let me fast forward to some of the most shocking parts of the show. For probably the first time in the history of beauty pageantry were contestants grilled with questions by two judges instead of one. Luckily for the contestants, the questions were very daal-bhaat in nature. I mean they were questions that even my one point five year old sister could probably answer. Questions like: name five big rivers in Bangladesh (this contestant obviously had hope because she named six); finish the rest of "Twinkle twinkle little star…" (to which she replied "how I howander howat eww arrr"); name an ocean (this one had more hope because she named two, one being Biddyashagor); etc, etc, etc. You get the gist right? If anything could be lamer than lamest questions of the two lame Q&A rounds, then it was the winner announcement ceremony. I mean how do you end up with two-second runners-up for crying out loud! If there's a tie for any of the top three positions, there are always bylaws for a tiebreaker. Well I stand corrected now, don't I? Thus the winners were announced and the MC started rattling off the prizes. At one point on the list he said that Walton had promised a DVD player to the second-runner up. His sympathy for the second runners-up having to share was very evident because he immediately announced that if the people from Walton were present, they should "pleaj" provide two DVD players. I mean who does that? Who gets up on stage after everything is announced and demands extra prizes. But that wasn't the end of it. Another guy then gets up and promises two of the losers a part in one of his TV shows. Come on people, there's an order to these things. First you only have one Q&A where (by the way) you ask fairly difficult questions. Second you announce all the prizes before the winners are announced, not after. Third, you NEVER have more than one winner for one spot. And lastly, don't get up on stage and start begging for extra prizes! That's like the last straw. Having watched this pageant I realized two things. First, feminists all over the world will be relieved because at least one country has proven them right: the contestants did lack grey matter. 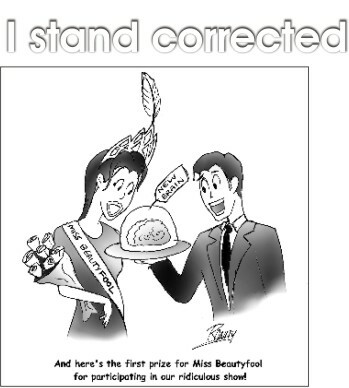 And secondly, people always stereotype beauty queens as being brainless. Well this contest's judges have shown us another angle. Why only pinpoint the contestants, judges can be equally empty-headed too. Thus, I for one, yet again, stand corrected! A few months back, my parents and I went to Bogra where my Boro Chacha was fighting for his life. The last time I had seen him had been five years back, when he was a much fitter man, full of life and spirit. Whenever he had hung out with us, the kinds of the family, he was a kid himself. He took us out fishing, mountain trekking, boating.... he even taught us how to burp out loud in the true Bengali style!! For hours into the night, he played monopoly with us, and always made sure that he lost. Chacha always had something to say, something to joke about, to laugh about. He had always been my hero, perhaps even more than my dad. When my parents had told me about his health, it really didn't bug me much. That man was an atom bomb of fun and spirit. I couldn't even imagine him lying on a hospital bed for more than three minutes. I hadn't ever seen him sit in the same place for three minutes! It just didn't fit it in the picture. For some reason, I just could not make myself believe that he was sick. I still felt the same excitement packing my bags. I made sure I took the monopoly board, and my deck of cards. I really did believe that I was going to have a blast with my hero! When we arrived in Bogra, I was the first one to run inside the house screaming "Chachu, chachu!" But this time, nobody ran towards me with outstretched arms. That is when the realization set in. I went to his room, with a heavy heart, not knowing what to expect. Once I saw him, I really didn't know what to do. The person who had played badminton with me so many times was lying on a little bed, with his eyes shut, and saline pipes connected to God knew how many parts of his body. His face had gotten wrinkled and pale. Every breath he took made such a heart wrenching sound that at that moment, I couldn't decide if his being alive was a good thing. I spoke to him in a loud clear voice, "Chacha, it's me Fahmina. Do you remember me?" He opened his eyes halfway through and stared at me for a long time. Then he broke into a smile. He mumbled something to me, but I couldn't understand. "What did he say?" I asked the nurse beside me. "I don't know. His speech is not comprehensible anymore. And he can't see," she replied. "But he was looking at me just now," I replied incredulously. "No, he was trying to look at you. But his eyesight is way too blurred for that." He could hear every word we said, and I knew him well enough to know just how badly he wanted to speak to us. I watched him try desperately, fervently, hopelessly to say something to me. But he couldn't. I could see the frustration in him, in the man who loved so much to chat, not being able to say out a single word. And then he broke into tears. He tried to talk again, and again he broke into tears. I could not stop myself from crying then. At that moment I understood the irony of life. The man whose only passion was life itself had lost his medium to life. This one event has changed my whole insight on life. I appreciate whatever I have right now since I really don't know when I'll lose it.